Current whereabouts/wellbeing: Deceased. Details of the circumstances of the self-immolation remain unclear. Info: News has just emerged of the self-immolation on March 13 of a Tibetan woman called Kunchok Wangmo, aged 31, in Dzoge (Chinese: Ruo'ergai) in Ngaba Tibetan and Qiang Autonomous Prefecture. Her husband called Kunchok Wangmo was detained in Dzoge, Ngaba and his whereabouts is unknown. Kunchok Wangmo's body was taken away by troops immediately after her self-immolation. According to the state-run Global Times, Ngaba officials now claim that Kunchok Wangmo was "strangled to death by her husband [Dolma Kyab], who later burned her body." (Global Times, 19 March 2013). Security force took her body. to imagine how you became to determine to give up your life so as your voice and thousands other voices for peace and freedom would be heard. Your Land of Snows is crying. Young Tibetans-in-exile take part in a candlelight vigil for self-immolators in Nepal's capital, Kathmandu, Feb. 13, 2013. A Tibetan woman has burned herself to death in protest against Chinese rule in Sichuan province's Ngaba (in Chinese, Aba) prefecture in the second self-immolation in a week, sources said Sunday. Kunchok Wangmo, 31, set herself ablaze in Dzoege (Ruo'ergai) county just before midnight last Wednesday but news of the burning was hushed up by Chinese police who had grabbed her body, cremated it and handed over the remains to her family, the sources said. Her husband, Dolma Kyab, was detained when he refused to comply with an order by the Chinese authorities who wanted to blame the self-immolation on a family squabble, one exiled Tibetan with contacts in the region told RFA's Tibetan Service. "The authorities wanted Dolma Kyab to declare that she burnt herself as a result of a family conflict and when he refused to comply, he was detained and taken away," Dzoge Lekshek said. "She died on the same day," he said. Kunchok Wangmo is the 15th woman to self-immolate since the burnings began in February 2009 aimed at challenging Chinese rule in Tibetan areas and calling for the return of Tibetan spiritual leader the Dalai Lama, who lives in exile in India. So far, 109 Tibetans have burned themselves in the desperate protests which are not petering out despite tighter restrictions imposed by Chinese authorities. On Saturday, a Tibetan monk from the restive Kirti monastery in Ngaba burned himself to death to mark the fifth anniversary of a bloody Chinese crackdown on Tibetans in the area, sources said. 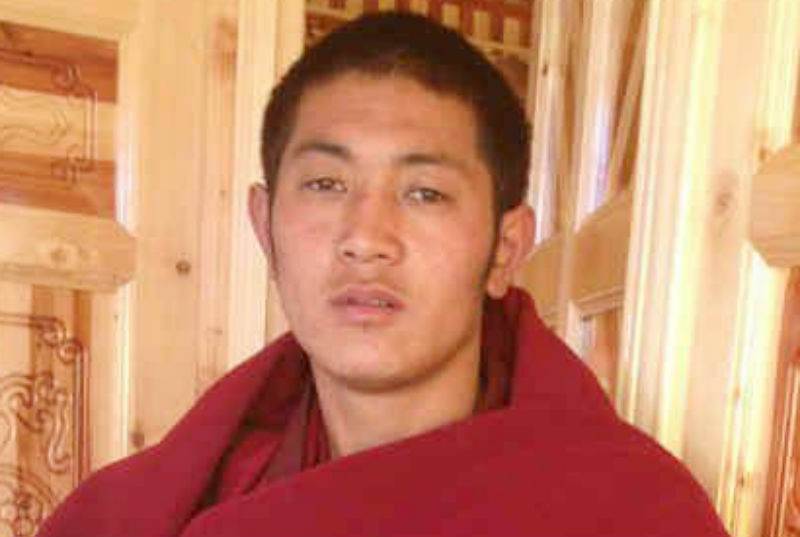 Lobsang Thokmey, 28, torched himself at the monastery which has been the epicenter of the Tibetan self-immolation protests against Chinese rule. The burning was aimed at marking the fifth anniversary of a March 16, 2008 crackdown on Ngaba in which Chinese police fired on a crowd of Tibetans, killing at least 10, including one monk, they said. The crackdown had agitated Tibetans in the area and helped spark the Tibetan self-immolations, sources said. The main road in Ngaba was declared last year as "Heroes Street" after it became the epicenter of the burnings. Chinese authorities have recently tightened controls in Tibetan-populated areas to check the self-immolation protests, arresting and jailing more than a dozen Tibetans who they have accused of being linked to the burning protests. Some were jailed up to 15 years. The authorities have also deployed paramilitary forces and have restricted communications in the areas where self-immolations have occurred. DHARAMSHALA, March 17: Exile Tibetan media are reporting on a self-immolation protest by a Tibetan woman on the eve of Xi Jinping’s formal selection as the new President of China earlier this week. Dharamshala: – March 17th 2013, Emerging reports from Tibet say two more Tibetan burned themselves to death in Ngaba county of Amdho region, eastern Tibet to protests against China's hardline and repressive policies on Tibet. The two incidents has pushed the total number of self-immolations in Tibet to 109, at-least 91 of them reportedly passed-away due to burn injuries. Lobsang Thokmey, a 28-year old Buddhist monk of Kirti Monsatery set himself on fire outside his monastery on March 16, Saturday afternoon (2.40pm). The monks extinguished the flames then took him to hospital, where he later passed-away," Ven Kanyak Tsering, from India based Kirti Monastery told The Tibet Post International. "However, a large number of armed Chinese security forces immediately arrived at the hospital and forcibly took away Thokmey's body," the sources said. "Konchok Wangmo, a 30-year old Tibetan woman burned herself on March 13, in Dzoge county, Ngaba, around 11.00 pm in the night. Sources said she died of burn injuries, on the same day the incident happened," another sources from Tibet said. According to the sources, "Konchok staged the self-immolation protest at the Chinese official building in Taktsa township in Dzoge county. The Chinese authorities reportedly took away her body and then cremated without informing her family and later only handed over the ashes to her husband." According to sources from inside the region, the Chinese authorities have threatened her husband Dolma Kyab to response to others that she has died by her suicide as a result of family crises. She was the 15th Tibetan female to self-immolate in Tibet. Dolma Kyab was taken away by Chinese police forces after the incident and his condition and well-being are unknown at present. The man and woman set themselves alight in separate incidents in different areas of Ngaba County. Konchok staged her protest just before China's new leader Xi Jinping was formally appointed as president and Thokmey set himself on fire just two days after Xi became as new Chinese president. Thokmey became a monk of Kirti monastery at his young age. He is survived by his parents - Rogtrug and Depo - and one sister and three brothers. Tibetan people in Tibet accuse the Chinese government of religious repression and eroding their culture, as they say tens of thousands of Han Chinese increasingly and illegally move into historically parts of Tibet. The communist regime rejects the allegation, claiming Tibetans in Tibet enjoy religious and cultural freedom. The regime also points to huge planing of investment it says has brought modernization and a better standard of living to Tibet. 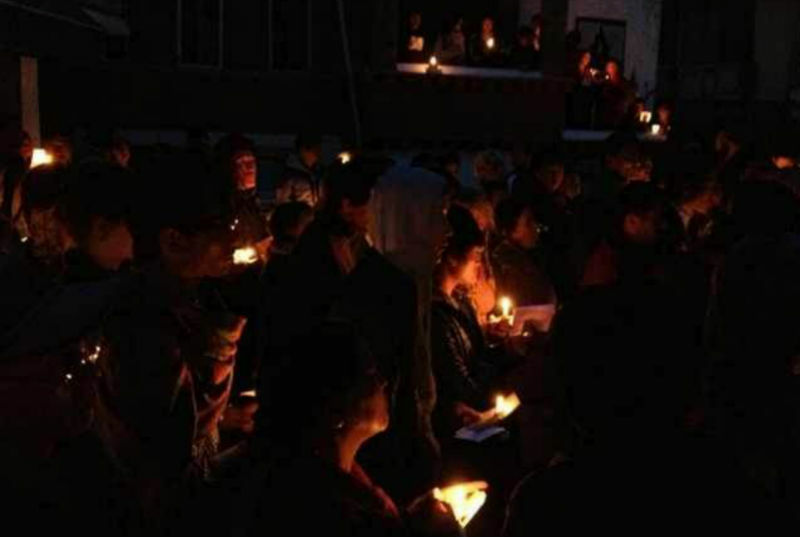 Soon after his self-immolation protest, on March 17, hundreds of exiled Tibetans and supporters held candlelight vigil expressing solidarity with Thokmey who set himself on fire in Ngaba on March 16, 2013. At-least 109 Tibetans- including monks, nuns, students and lay people - have set themselves on fire in Tibet since 2009. The most common call for the return of the spiritual leader His Holiness the Dalai Lama, the preservation of the Tibetan language, and an end to restrictions on freedom of religion. However, many also called for Tibetan independence. The monk set himself on fire Saturday inside his room in Kirti monastery in Sichuan province’s mountainous Aba county, RFA said. Carrying a Tibetan Buddhist prayer flag, he ran toward the monastery entrance before collapsing and was rushed to hospital where he died, the report said. A man who answered the phone at Kirti said the monastery was open to the public, but hung up when questioned about the self-immolation report. Calls to local government and police offices rang unanswered. The London-based advocacy group Free Tibet also reported Lobsang Thokmey’s self-immolation. It said a large force of security personnel at the county hospital had removed his body. Confirming claims long circulating among Tibetan activists, the official Global Times newspaper last week said that family members of those who self-immolate were barred from retrieving their relatives’ bodies, while neighbors were not allowed to offer condolences and monks were barred from offering prayers for the dead. Kunchok Wangmo, 31, set herself ablaze in Dzoege (Ruo’ergai) county just before midnight last Wednesday but news of the burning was hushed up by Chinese police who had grabbed her body, cremated it and handed over the remains to her family, the sources said. Her husband, Dolma Kyab, was detained when he refused to comply with an order by the Chinese authorities who wanted to blame the self-immolation on a family squabble, one exiled Tibetan with contacts in the region told RFA’s Tibetan Service. The main road in Ngaba was declared last year as “Heroes Street” after it became the epicenter of the burnings. See also Flames of Protest: The History of Self-Immolation, via CDT.